Students of Spanish literature have long been familiar with this eight-hundred-year-old epic detailing the legendary exploits of the soldier-adventurer Ruy Díaz of Bivar, El Cid, and of his part in the long struggle between Christianity and Islam. The epic poem recounts the adventures of the Cid; of his peerless steed, Babieca, and of his two famous swords, Colada and Tizón; of his wife, Doña Ximena, and his two daughters, Doña Elvira and Doña Sol, who found sanctuary with Abbot Don Sancho in the monastery of San Pedro de Cardeña during the Cid's exile; and of the despicable and black-hearted princes of Carrión, Diego and Fernando González. Lesley Byrd Simpson was a renowned translator of many great works of Spanish literature. 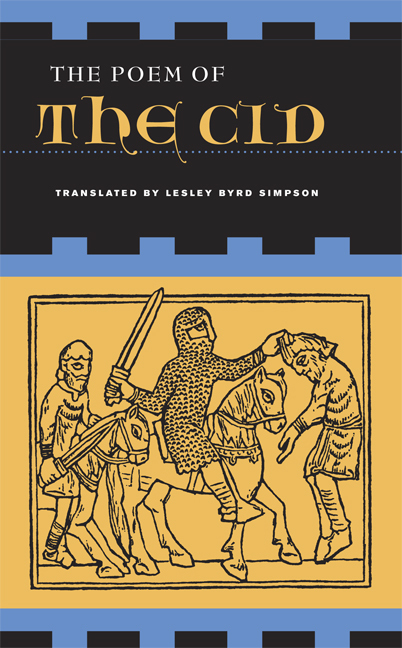 His translations of The Celestina and The Poem of the Cid (both UC Press books) in particular preserve the vigor and colloquial flavor of the original.